Making food should be fun. Sometimes it’s not much fun, I’ll admit. Creating food that is fun to see, and eat, can be rewarding, though, even if making it presents a few problems. One of our family’s traditions is that I make my kids a special birthday cake, decorated according to their interests and personality. For better or worse, my 20 year old son is a Brony. For those who don’t know, a Brony is an adult fan of the My Little Pony show. Yes, Virginia, my son watches a show designed for little girls. He’s not alone. There are plenty of adults from all walks of life that love that show. 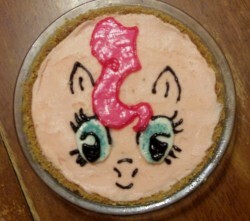 With that in mind, I had to figure out how to make the Boy a My Little Pony themed birthday cake. The Boy is not a huge cake fan. Neither is his younger sister. His favorite My Little Pony character is named Pinky Pie. In a state of punnific inspiration, I threw out the cake idea and make him a birthday pie, instead. I didn’t have a lot of time with this one so, I did the only thing a sensible person would do. I turned to the baking shelves in the grocery store and bought a cheese cake mix, adding a bit of red food coloring to make it pink. Next came the pattern. I’d found a Pinky Pie t-shirt for sale on the web, and downloaded a picture of it, copying the stylized portrait of that particular little pony onto a sheet of paper to make a pattern for the top of the cake. Fortune smiled on me in the form of left-over fondant in the freezer. I mixed more red food coloring with some of it to fashion the mane, and left the rest white for the eyes. For the iris, I mixed up some blue food coloring with granulated sugar and sprinkled it on top. The rest was a combination of red and black decorating gel. A word of warning about decorating gel. Don’t apply it until just before serving. It will separate and seep a colored sugar-water over the rest of your project if you let it sit very long. Blech. I’m not going to kid you. It was fun, but it was a pain. I had trouble with the pattern. It stuck to the top of the cheesecake when I was trying to transfer the outline. The fondant kept getting way to warm to handle way too quickly and didn’t want to behave, especially for the mane. The blue sugar didn’t want to lay down where I wanted it to. (In retrospect, I should have made the irises from blue fondant). I had to make it a day prior to my son coming for a visit, due to scheduling problems, and so I was mopping up red and black seepage from the gel before showing it to him. ARRRRGGGG! The work was worth it, though, at least in retrospect. It really was fun to present, and eat. My wife and daughters were impressed. My son was ecstatic. How could he not be? I’d make him a Pinky Pie for his birthday. Sometimes, you just want a big sandwich. I’m not talking about peanut butter and jelly, although I enjoy those quite a bit. I’m talking lots of deli meat, cheese and other stuff hot off the grill. Enter, the Reuben sandwich. The classic Reuben is a hot sandwich, chock full of corned beef, with swish cheese, thousand island dressing and sauerkraut, served on rye bread and then grilled. Several variations exist including the Rachael, substituting pastrami or turkey for the corned beef and coleslaw for the sauerkraut. On the west coast and in Vegas they substitute Dijon mustard for the thousand island dressing. In Florida they really get weird, substituting grouper for the corned beef and using coleslaw. The origin of the Reuben depends on who you talk to. One account credits Reuben Kulakofsky, a Lithuanian-born grocer from Nebraska. It may have been a group effort by Kulakofsky and his poker buddies. They held a weekly poker night in the Blackstone Hotel between1920 and 1935. The sandwich first gained local fame when Charles Schimmel, the hotel’s owner, put it on the Blackstone's lunch menu. Another account credits Arnold Reuben, the owner of the once-famous Reuben's Delicatessen in New York. According to an interview with Craig Claiborne, Reuben invented the "Reuben special" around 1914. A few others are around as well, blaming different culprits and celebrities. Whatever story is true, this is a filling and satisfying sandwich. Rinse the sauerkraut in a mesh strainer under cold running water. Drain well and squeeze out as much excess moisture as you can. Press gently down on the sandwich to set everything together. Heat a large non-stick skillet over medium-low heat. Spread 1 teaspoon butter over one side of each sandwich and put them in the hot skillet, butter-side down. You should be able to do two sandwiches as a time. Place a dutch oven, stockpot, or a cast iron skillet over the top as a weight to press them down. Cook until crisp and golden, about 3-5 minutes. Remove the weight and spread more butter on top. Flip the sandwiches, replace the weight, and cook for another 3-5 minutes. Transfer to a wire rack set over a baking sheet in the oven to keep them warm while you cook the remaining sandwiches. Cut them in half if desired. Serve with pickle and potato chips. If you have an electric grill, or pannini grill, the process is much simpler. Butter both sides of the sandwiches and cook until crisp and golden.